2015. By Steve Bailey/With Brio. 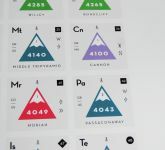 Just in, this unique poster designed by a veteran White Mountain hiker presents a wealth of data on the 48 New Hampshire 4000-foot peaks in a format similar to the Periodic Table of Elements. Given for each summit is a difficulty rating, elevation, elevation rank, # of trails at summit, view type, summit type, Federal designation, county location, land manager, region within the Whites, and other features. 18" x 24," printed on 80# glossy stock. Ships in cardboard tube. Will begin shipping this item on August 24, 2015!